It is widely accepted that urban design is an important aspect of the planning process to create economically and socially successful places to live, work and visit. Investment in design quality brings quantifiable financial returns and people value public realm improvements that boost civic pride and enhance civic image. 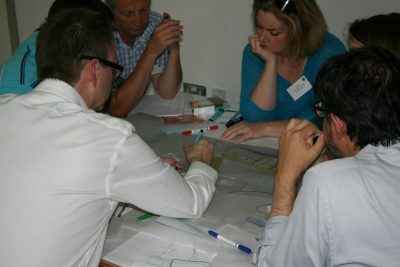 In the context of the National Planning Policy Framework’s strong emphasis on design quality, this one day workshop was designed to help planning officers, house builders, and design champions optimise their skills to bring about high-level public realm improvements in their locality. The workshop introduced participants to the key principles of urban design then during the course of the day demonstrated how to apply these principles in the more detailed design of public spaces and streets. Participants learnt from engaging speakers, examples of good practice, a study visit, group discussions and hands-on sessions.